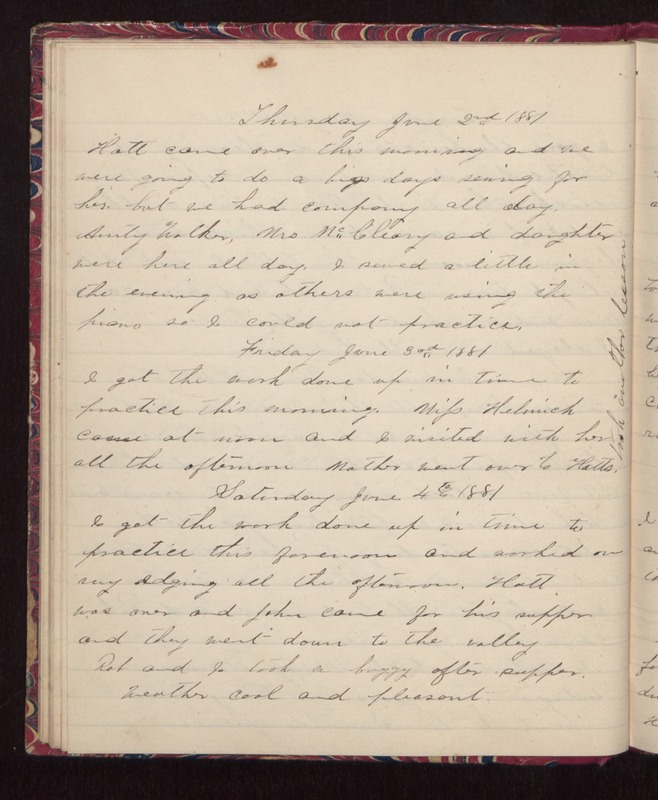 Thursday June 2nd 1881 Hatt came over this morning and we were going to do a big days sewing for her, but we had company all day. Aunty Walker, Mrs McCleary and daughter were here all day. I sewed a little in the evening as others were using the piano so I could not practice. Friday June 3th 1881 I got the work done up in time to practice this morning. Miss Helmich came at noon and I visited with her all the afternoon. Mother went over to Hatts. Took another lesson. Saturday June 4th 1881 I got the work done up in time to practice this forenoon and worked on my edging all the afternoon. Hatt was over and John came for his supper and they went down to the valley. Rob and I took a buggy after supper. Weather cool and pleasant.